Video from Eric Letrendre - only use a leash for back up. Do not yank the leash on purpose. As you are walking through the house, if your dog runs in front of you, turn around and go in the other direction so the dog is forced to follow. Do this every single time the dog runs past you. You can also treat the dog whenever he/she is behind you. Another method mentioned in Campbell's book goes like this: Get up to go to the door. If the dog tries to go with you, sit back down and the dog should follow you back to your chair. Then try again. Keep doing it until the dog stays in place and doesn't follow you to the door. After you have some door manners established, you should never 100% trust your dog. Continuing to use the crate or bedroom or garage is a good idea. 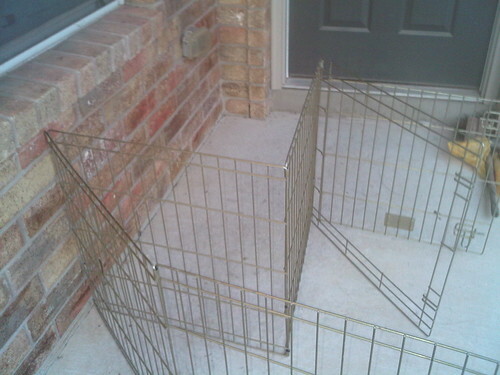 But if you don't want to do that all the time, set up some barriers inside and outside the house. Many dogs can get over or through baby gates or play pens but these items will still slow the dog down. Time enough for you to get the dog's attention. The next step would be to start a life long regimen of obedience training with a skilled and competent trainer. Obedience training that seems unrelated to the issue can be quite helpful. Teaching a dog obedience commands will help the dog with impulse control, hyperactivity, etc..
You can look for a trainer at this site: apdt.org. Do not use a trainer who uses aversives like yanking (leash pops, leash "corrections", hitting, scolding, etc.. The next step would be to try some counter conditioning and desensitization to fast moving things. Here is an article on dog reactive dogs. Pet parents can just replace "running humans" for "dogs". Some good trainers - Karen Pearce, Diana Wilkins, Gary Oswalt. SA Big Dawgs has free training. Set up a benevolent "Nothing in Life is Free" program. A good book on this subject is How to be the Leader of the Pack and Have Your Dog Love You For It by Patricia McConnell. Next have a highly skilled trainer help you impliment the Premack principle to work with (instead of against) the dog's strong prey drive. Read Oh Behave by Donaldson to get some idea of how a trainer should be helping you. The dog must wear a properly fitted martingale collar . (a good trainer can help with this) The martingale is not for every day use. Use a regular collar for ID tags. Put on the martingale for walks. Continue with training all the time, keep the barriers up at all times. Keep the dog leased any time he is outside the house - even if it's only for a second. The leash must not come off unless the dog is completely inside the house with the door is closed. Physical and mental exercise is important. Exercise the mind and body every day.. If the dog is not already spayed/neutered, get this done right away.